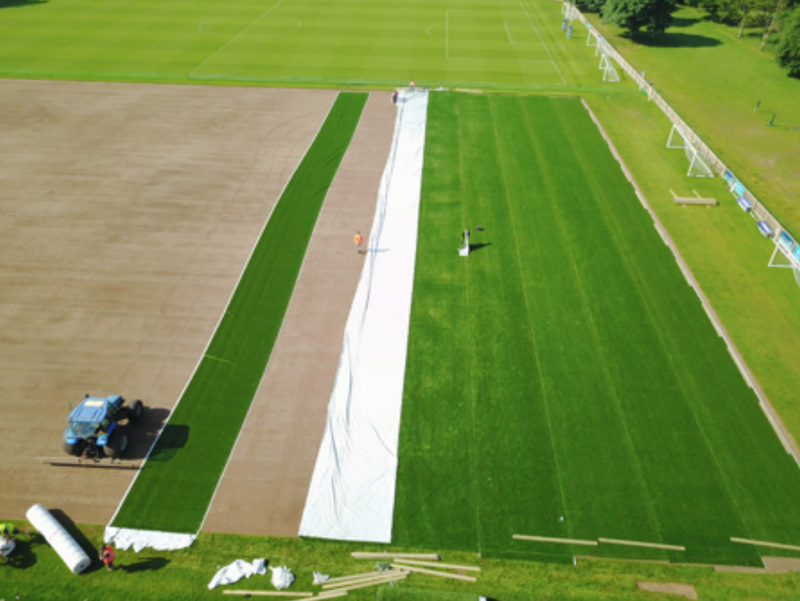 Within the last five years we have seen a dramatic increase in the installation of synthetic turf stabilisation systems, mainly driven from the success of the tried and tested stitched systems now being used in many stadium and training ground pitches around the world. These Hybrid Grass systems come in all manner of guises, ranging from sown in filaments to insitu based synthetic carpets that are top dressed with rootzone materials and overseeded to produce an hybrid grass playing surface. One of the latest products on the market is PowerGrass. And one of the first pitches to be constructed with this new Hybrid Turf system is one at Bisham Abbey installed by Agripower last May. 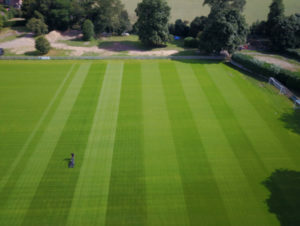 A recent conversation with Philip Coxhill, Grounds Manager at Bisham Abbey, and Graham Longdin, MD of Agripower, gave me a greater insight into this new PowerGrass Hybrid grass pitch. The system was developed in Italy with many trials ran to test it performance and ability to produce a robust reliable playing surface, the makers PowerGrass claim this hybrid turf has innovative features and offers better playing and growth conditions than any other system of reinforced natural grass or old type hybrid grass and at the same time is the only one that offers a sports field playable even without the natural grass. The synthetic turf is stable and the natural grass can be easily installed with simple seeding. PowerGrass hybrid turf is not simply a product, it’s a complete system, this new system has been designed to take into account the many physical, chemical and mechanical inter-actions that take place when maintaining a natural turf playing surface. At present 95% of hybrid pitches are built purely on sand and some are in fact buried benneath the top, leading to very hard surface requiring aeration purely to soften the surface for the user. Powergrass is the first system to address the issue and seek to better the current trend. To find out more, I contacted Graham, who had installed the new pitch at Bisham. I believe this is the first Powergrass pitch in the UK to be installed? Yes, we installed the Powergrass Pitch last June at Bisham Abbey working closely with their grounds manager Philip Coxhill. Is this one of your own innovations? Yes, we helped design the hybrid carpet and increased the amount of fibres avaliable for play, and enabling the system to cope with very heavy usage, rather than mimic the existing hybrids we sought to better them. How long have you been perfecting this system? The first fields were laid in Italy, and then followed up with two further fields in Holland, we then had our input, to make a more resilient surface for the UK market. The new carpet was first Laid in Grosetto in Italy which is the field TGMS (TurfTrax Ground Management Systems Limited) went to view prior to us being awarded the contract at Bisham, two further fields have been installed in the UK since then and we have strong enquires and looking forward to a busy season in 2018. How does this pitch system work, what is its specification and how is it installed? The pitch system can work either with a full construction of a drained plateau with a shallow 80mm gravel raft , and 80mm of rootzone/sand, mixed with a combination of naturally occurring additives. The Powergrass carpet is laid and stiched together over the growth medium and then filled to a depth of 35mm leaving 25mm of free pile above the soil. A pre seeding fertiliser is then appliead and then seed at a rate of 50g/ms. All fields must have irrigation to promote controlled growth. Where the system differs from traditional ‘stitched-in’ hybrids is that it can be laid over existing pitches, subject to enhanced drainage if required, such as Bisham.Working in conjunction with a leading pitch consulatnt the existing field is accessed and tested to ensure that the Powergrass system works in harmony with the existing site conditions. This innovative system can dramatically reduce on-site costs and reduce construction time in half. What other systems are you up against? Stitched in systems would be the target competitors as they are more recognised in the market place although far more expensive. Some other carpet systems rely on being biodegradeable and these has proven to have had some issues with establishing rootgrowth. Powergrass allows the roots to penetrate the carpet backing from day one and is playable within four weeks from initial seeding as long as the maintenance regime is intensive and correct. Other hybrid carpets are not stitched together and some are completely buried in sand and only stabilise the top sand layer or they replicate the traditional systems with fibre content around the 30000 fibres to 1 m2, Powergrass has nearly three times more fibre and combined with additives creates a softer surface and allows the fibres to be in play and protecting the crown of the grass plant. Is this system suitable for both Rugby and football? Testing is currently ongoing but initial results are very favourable with the pitch being used currently to 25hrs per week . Initial player feedback is very good with the resounding comment that it is a far softer and more comfortable pitch to play and train on. What is the overall cost of supply and Installation of this product? What is the recommended maintenance regime for this system? We recommend that an overseeding of 5g/m2 every 6 weeks combined with a light scarification to keep the pitch in good condition and avoid any heavy end of season maintenance. Other than that, treat as any high quality pitch, with cuttings being removed at all times, the surface is designed to be softer and doesn’t require regular vetidraining to relieve hardness only to aerate, at this stage we believe that aeration should only be required 1-2 times per season. The failing of most existing Hybrids are hardness; historically the industry has been obsessed with drainage and this has led to pitches being built on straight sand which has excellent drainage properties but at the cost of the players premature fatigue and potential injuries. Powergrass has been developed by Agronomists, natural grass consultants and carpet manufacturers and to this end it is all about the player and the grass and the system below and not about selling carpet volume. When did you start the installation of the Bisham Abbey Pitch? 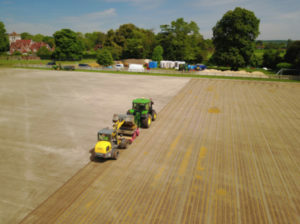 After some preliminary meetings with the clients (Bisham Abbey represented by Phil Coxhill and their consultant partners TGMS Limited.We, where able to start work last May effectively installing a Powergrass reinforced system into an existing fully drained pitch. How was the Powergrass carpet installed? We basically removed, koroed off the top 40mm of the existing turf and rootzone materials, power harrowed to open up the top 25mm and re-graded the levels. 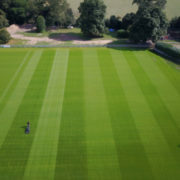 The pitch was then Vibra Sand mastered to reconnect the existing drainage bands, vertidrained to decompact the top 150mm and then top dressed with cork, coco fibre and zeolite materials. This mix of organic matter was then incorporated into the existing rootzone to improve shock absorbancy and fertility. The pitch was then final graded and then rolled to firm the surface ready for the Powergrass system which was laid and stitched in place; after filling with a further 35mm of infill material the system was then fertilised and seeded with Barenbrug Bar RPR Stadium. Having favourable soil and air temperatures in June, the seed was up in four days and we were cutting after ten days. The pitch is now performing very well, with players commenting on how well it plays, especially noticing it is much softer than the previous playing surface. Also, the wear factor has been amazing, the pitch has been able to accommodate more fixtures, in fact it is now providing over 25 hours use a week compared to the 12 hours it could stand previously. Phillip Coxill has been extremely pleased with the results and is now considering the installation of some more Powergrass carpet to increase the training areas at Bisham Abbey. Works complete, irrigation on for the first time.